What is a S’more? In short, a S’more is a thing of beauty. These traditional American campfire treats are made up of a fire-roasted marshmallow and melted chocolate sandwiched between two Graham crackers (similar to digestive biscuits). The word S’more comes from “some more”. It’s not hard to see why – they are incredibly addictive! In honour of National S’mores Day in the US (one need not be American to celebrate such an incredibly important day), I decided to make a slightly more sophisticated version. These gorgeous tartlets have a crunchy biscuit crust, rich chocolate custard filling and gooey marshmallow-meringue topping. A dessert that you could happily serve to guests at a smart dinner party. They can be made in advance up until piping and toasting the meringue, which is best done right before serving. For a S’mores showstopper, check out this cake. Grease 6 x 10cm fluted tartlet tins (preferably with a loose bottom for easy removal) or spray with cooking spray. Preheat the oven to 160°C. Use a food processor or rolling pin to crush all the biscuits into fine crumbs. Mix in the melted butter. Divide the biscuit mixture between the tins and press down very well. Refrigerate until needed. To make the filling, break the chocolate into pieces and place in a heatproof bowl. Place the cream, milk, sugar and salt into a small saucepan and heat over medium heat, stirring to dissolve the sugar. Once the mixture comes to a boil, remove and pour over the chocolate. Leave for 1 minute then stir well until completely smooth. Allow to cool for a few minutes, then mix in the egg. Place the tartlet tins onto a baking tray. Pour the filling into the tins, being careful not to overfill. There may be a little mixture left over. Bake the tartlets for 12 minutes. The middle of the filling will still be a bit wobbly! Allow to cool completely. Once at room temperature, refrigerate the tartlets until needed. 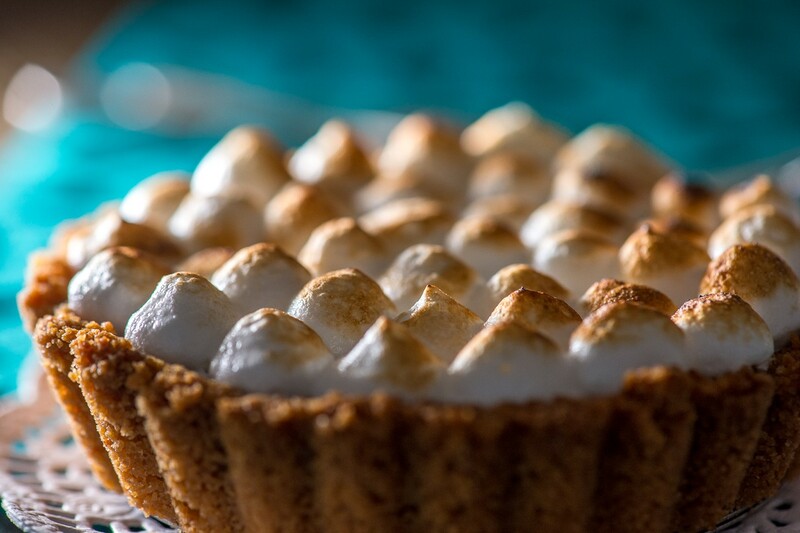 To make the marshmallow topping, use an electric or stand mixer to beat the egg whites and lemon juice in a heatproof bowl until just starting to form soft peaks. Heat the sugar and water in a small saucepan until boiling. Use a wet pastry brush to brush any sugar crystals down from the sides of the saucepan. Continue cooking until the syrup reaches 115°C on a sugar thermometer. Remove from heat and pour the syrup into the egg whites in a slow, steady stream, whisking continuously. Drizzling the syrup down the sides of the bowl will cause it to set hard before being mixed so ideally you want to aim to pour the syrup close to the whisk/beaters. The trick is not to let the syrup hit the whisk or it will splatter onto you or the sides of the bowl! Add the vanilla extract and keep whisking the meringue mixture until completely cool – this takes about 10 minutes. The mixture will become thick and glossy. Spoon into a piping bag fitted with a star or round nozzle. Don’t scrape any unmixed syrup out of the bowl. Just before serving, pipe little meringue kisses on top of the chocolate filling (or simply spread/spoon the meringue on). Use a blow torch to toast the meringue (or place briefly under a hot grill) and serve immediately. *The closest equivalent to Graham crackers in South Africa is a digestive biscuit. Tennis biscuits come in a close second. As a result, I made the base with half of each, but you could easily use 200g of either of them.